AS IT STANDS: Trump-Clinton Election Would Feature The Most Unpopular Candidates Competition Ever! 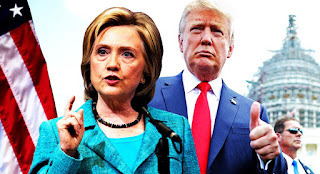 Trump-Clinton Election Would Feature The Most Unpopular Candidates Competition Ever! Calling all history professors and students! I'd really like to know if there's ever been a presidential election (American) as weird as this one is shaping up to be? I know there were some real nasty presidential elections in our history with the dirtiest one probably being the Andrew Jackson/John Quincy Adams contest of 1828. One example: Adams accused Jackson of adultery and living in sin and claimed his wife Rachel was a bigamist. Talk about fighting words! Bombastic, and egotistical presidential Republican front runner, Donald Trump, has easily set back the art of civility a 100 years. He's rude and proud of it. However, political pundits are starting to think Trump may be the GOP nominee and he'll face Hillary Clinton. Clinton brings enough baggage to sink a ship, but has somehow forged her way into being the front running Democratic nominee. Now get this: if Trump and Clinton do match up it's going to be a first for a really weird reason. In a Trump-Clinton election you'll have both political parties picking their MOST UNPOPULAR candidates! A recent NBC/WSJ general election poll showed Trump with an un-favorabilty rating of 59%, and Clinton with an un-favorability rating of 50%. That's insane! With both parties unleashing Pandora's Box by selecting the most unpopular and polarizing figures we can expect to see the most divisive and scorched earth style election ever! Now, I could be wrong. That's where I need a history professor, or student to set me straight.